David Ferguson from SCOR Global Life shares some fascinating findings about wearable technology. 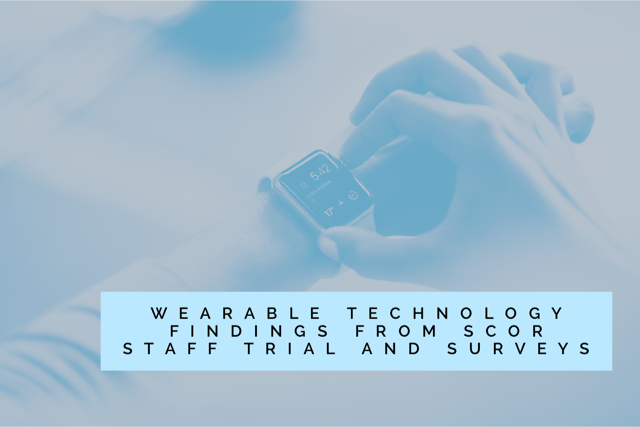 Last year SCOR Global Life shared details of our staff survey about wearable technology with Protection Review. In November 2015 we expanded our research by monitoring results from Fitbit Charge HR devices for our staff to see what sort of data we could get and what we might be able to do with it. We wanted to find out whether offering these devices as rewards & incentives encourages people to use them or changes behaviour and if so, whether those behavioural changes remain. Of course, we also hoped that everyone would have fun along the way challenging each other and creating a sense of healthy team competition! We are pleased to share this further update. 69 participants joined the SCOR Global Life Fitbit Trail which started on 9th November 2015, agreeing to wear the Fitbit Charge HR sharing data on steps walked, floors climbed, active minutes etc. We also set out to periodically measure BMI and blood pressure in our group to track any changes over time and to work out whether wearing the device had any impact on these factors. We took measurements in October 2015 just prior to the start, at the midway point in December 2015 and in April 2016, which was just about one month before the end of the trial. 62 of our participants (90%) provided some health measurements at the outset. Our measured BMIs and BPs were slightly better than the insured population but overall broadly similar once adjusted for age. Those who reported themselves to be in better health and/or as more frequent exercisers were more active and recorded more steps throughout the trial and we found that self-reporting within our group seemed fairly accurate with participants answering questions on their exercise levels realistically. We saw that those with normal BMI, ideal BP and a lower heart rate, i.e. 40-59pm generally recorded a higher level of activity and steps, and that in particular, heart rate was a good indicator of those who undertook more activity; those in the best category recorded almost 20% more steps than the average of all participants but this increased to 30% when compared to the highest heart rate group. This was also true of ‘very active minutes’. This was very noticeable in those with the best heart rate with this group recording in excess of 40% more very active minutes than the average of all participants. Very active minutes was not defined by Fitbit but we took this to mean more exercise than just brisk walking, e.g. running, playing sport. This has led us to question/ask whether heart rate is a good indicator of future health though it is much too early to say without further analysis/research. We found on average that only small changes in health readings occurred between the initial and final measurements carried out. There was no trend in health readings when we split participants by levels of recorded activity or steps but there were huge variations individually. However these variations in recorded heart rates and BP were probably a result of natural fluctuations rather than any actual improvement or deterioration. In the first month of the trial, when enthusiasm was high, the recorded steps were 7% higher than in the second month (excluding days on which no steps at all were recorded). By month three, the recorded steps were 2% lower and some of this might have been due to the Christmas period. When we looked at the days when active participants recorded no steps at all, this rose from just 3.6% in month one, to a huge 30.4% in month five. At Christmas, 36% did not record any steps on Christmas Day, and of those who did, 48% had no very active minutes. From our final survey in May, completed by 71% of our participants, we learned that 62% said they changed their behaviour when approaching the pre-set step target of 10,000 steps per day. 56% felt that their device drove them to sometimes change their behaviour. It was for example, very interesting to see that as people approached 10,000 steps there was a large ‘spike’ in activity to ‘get over the line’ at 10,000. From our total of 69 participants at the start, 16 were no longer using their device by the end of the trial (as measured by people who hadn’t ‘synced’ their device in the previous two weeks). And we now know that a further 9 people became inactive (up to 2nd June). From those who answered our final survey, 92% said they’d continue to use their device at the end of the trial. However, if we assume that all the inactive users who didn’t answer the survey won’t continue to use their device, then this figure drops to 74%. How did people feel about the data provided by the device? We asked everyone to rank the various outputs in order of preference. Almost half rated the step count per day as the most useful item while a quarter found the resting heart rate most useful. The least useful piece of information was the number of floors climbed during exercise. The sleep information polarised our participants; some rated this highly while a quarter rated it as the least useful item. How did people feel about using the device for insurance premium discounts? Our final survey asked participants what size of premium discount they would like to see from sharing their Fitbit data with an insurer. Almost 80% said they would be willing to share data and just 9% had concerns about data security as their primary reason for not being willing to share data for a premium discount. The remainder just felt it wasn’t worth the trouble of wearing one to get a discount. In terms of discounts, our younger participants were happier with a smaller discount than older ones. This has been, and will continue to be a fascinating insight to the world of wearable technology and its effect on behaviours. It is worth bearing in mind that our sample size was pretty small at just 69 participants and they are of course a well-informed group of professionals working in our industry, had the device supplied to them and have been competitive between teams so perhaps we would see different patterns emerging from the general population. This may not be entirely representative but gives us some good insights. Offering these devices to applicants for a policy may help to attract a fitter, healthier set of lives and generate a greater level of interest in taking out the product compared with other protection products available. For those customers who are perhaps less fit and healthy, engagement with the device and any incentives offered for healthy behaviour may help result in an improvement in health and fitness, although our discussions with others in the wearable tech field lead us to believe these impacts will probably be small. We believe the main gain for insurers will be from increased customer engagement and the resulting improvement in persistency. Our research will continue as we seek opportunities to show our clients our expertise in this area, placing us at the forefront of market developments and opportunities. We’ve learned a lot about the challenges of setting up a pilot too which stands us in good stead for being able to help our clients set up their own pilots.